On most occasions I prefer indie games over AAA titles. Sometimes I like a simple game that has a modest approach to game design. I saw Never Alone (Kisima Ingitchuna) at E3 this year and I was interested. I loved the art style and when I researched it a bit I really liked the idea of Alaskan Mythology being told through the gaming medium. We have plenty of Norse, Greek, and Egyptian Mythology running through games, but literally zero Alaskan. I really enjoy unique games, and Never Alone (Kisima Ingitchuna) fits into that category perfectly. Here’s my Never Alone review! There is a never ending blizzard that is plaguing the land. A young girl named Nuna is accompanied by a snow fox inhabited by a spirit. Together they must endure the harsh blizzard and discover what is causing it and how to stop the event. If they don’t, it could mean the end for Nuna’s village. The story is by far the best reason to play this game. The narration is amazing because it gives you a fantastic sense of oral tradition. That you are sitting next to a grandfather or elder telling you a very old story. It’s very warming to listen to. It is also entirely in the Inupiaq language. The atmosphere is very well done in Never Alone (Kisima Ingitchuna). There are two kinds of cutscenes. One is done with the in game graphics, and another is done with what appears to be live cave drawings. Both of which are gorgeous to look at. The art does an amazing job with setting the mood. It is simply gorgeous. 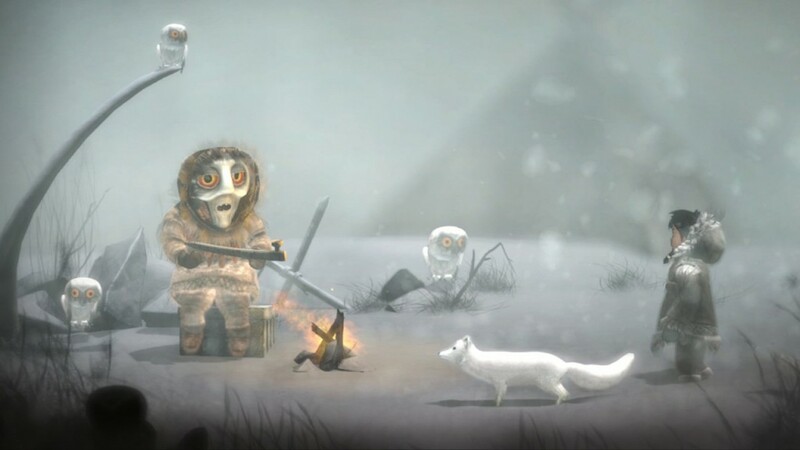 Gameplay wise, Never Alone (Kisima Ingitchuna) is rather limited, but that’s ok. As a puzzle platformer, the developers kept things simple but still somewhat challenging so the game flows nicely. 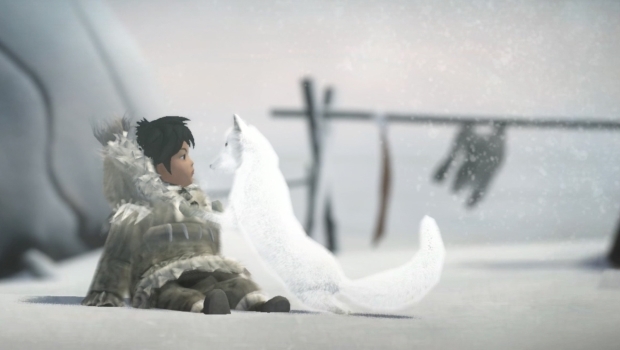 You can play as one of two characters: Nuna and the Arctic Fox. Both make sue of their own abilities to traverse the environment. The fox can wall jump and bring forth spirits to help Nuna move along. Nuna has the ability to interact with objects like boxes. You can switch between the two at any time but you can also play local Co-Op with one person controlling each character. Most of the puzzles are environmental, so you will use the fox to get to high areas while Nuna will use her Bola (weapon) to break ice. Nothing is too ambiguous for the player. The level design is good enough to steer you in the right direction and give enough visual queues to let the player know who they have to control and how to solve the puzzle. Some of them take skill. Using Nuna’s Bola is one of the more challenging bits because of how it is aimed and thrown. I would have to say the biggest problem with Never Alone (Kisima Ingitchuna) is the movement. Jumping is very floaty and it can be difficult to gauge how far you need to jump to cross a gap, or how high you can jump to grab a ledge. One of the more frustrating bits was trying to get off a box I had to move. The character would just stop at the edge and not walk off. So I would have to jump, but because of the jumping mechanics, I would accidentally jump off the edge of the platform. This happens a lot. The spirits that show up as platforms can also be somewhat of a challenge to navigate or even see. Everything is snowy, the visual signals for nearly spirits are also white. That’s the design flaw, but if you run and jump around with the fox enough the spirit will most likely show up and you can go from there. The game also suffers from clipping issues. Often times I would be catapulted into the air after climbing a ledge or I would step across some debris and Nuna would be ankle deep into the ground unable to accurately jump. Normally these bugs would factor in heavily on the final score for this game, but there are exceptions. Never Alone (Kisima Ingitchuna) is not made by industry veterans. This was the developer’s very first game, and that is a very daunting task. The glitches can make the game tougher to play than it needs to be, but you have to start somewhere and learn from it. The game has minimal replay value and it is still rather short so it leaves you wanting more. 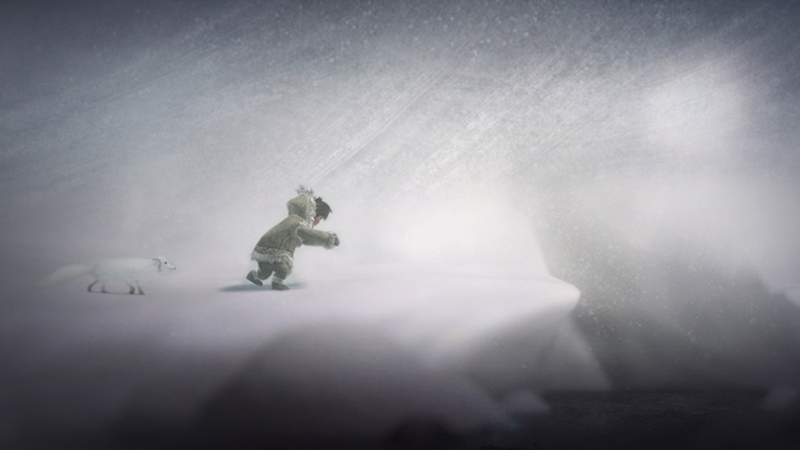 Roughly 40 Native Alaskan Elders, storytellers, and community members came together and create this game to help preserve the Inupiaq culture and I feel as though Never Alone (Kisima Ingitchuna) does a fantastic job of doing that. The game is fun, but it also tells a very interesting story that keeps you wanting to know what happens next. The art direction is unique and beautiful. For a first attempt at game development, Upper One Games did a damn fine job. 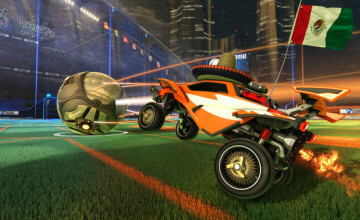 You can pick he game up on the PS4, Xbox One, and PC now. ← Previous Story Dragon Age: Inquisition Review: It’s So Damn Big!